Submarines – Capable of independent operation underwater! Even if all of us cannot afford a submarine of our own, the vicarious pleasure of knowing about one can raise our adrenaline to new heights. A famous quote by H.G. Wells in the book ‘Anticipations’ about Submarines, “I must confess that my imagination, in spite even of spurring, refuses to see any sort of submarine doing anything but suffocating its crew and floundering at sea”. An independent Autonomous body that can float (or) sink on ocean waters as per the condition. Usually submarines are used to attack the enemy ships and other illegal navigation activities of the enemies that take place through oceanic waters. The first operating Submarine was initially tested by Cornelis Drebbel. 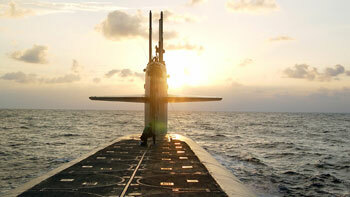 These Submarines plays a major role in the country&apos;s Navy. These submarines can enter the enemies waters and can possibly attack. These Submarines allow scientists to study about the deep oceans and can explore the marine life. Submarines not only are used for Navy and Scientific exploration but also for tourists who wanted to see the beauty of the aquatic animals. 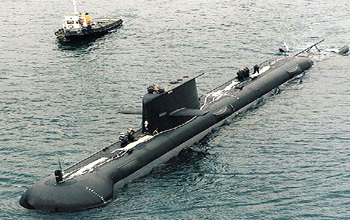 A separate type of submarines called tourist submarines have been developed for this purpose. Power supply to Submarines Submarines need electric power to operate the equipment on board. To supply this power, submarines are equipped with diesel engines that burn fuel and/or nuclear reactors that use nuclear fission. What is the Fuel used for Submarines? In the beginning the submarines used to work with the diesel power, later many disadvantages were identified during its usage. For Example, the exhaust of the gases was a big problem when the machine is under waters. The oxygen present in the cabin of the submarine used to be filled up with these exhaust gases making the people to suffocate and finally leading to death. Later on, fission powered nuclear reactors came into existence which provide clean source of Energy without any emissions. The fission process includes splitting of atom by bombarding it with a fast moving neutron, on an average 3 neutrons can be produced per fission. These neutrons will be absorbed by the control rods, inserted in the nuclear reactor of the Submarine. Hence the process can be controlled. The energy produced during this fission can be used to produce the steam which powers the turbine of the Engine. Also using fission the submarine could stay longer beneath the waters than the diesel powered submarine. Submarines - buoyancy Submarines are a mixture of metal (the hull), air, and water (the “ballast” tanks). The tanks can be filled with and emptied of seawater and air, which allows the submarine to sink or rise in the water. How can an object float in water? When an object is placed in water, there are two primary forces acting on it. The force of gravity yields a downward force and a buoyancy force yields an upward force. The gravitational force is determined by the object&apos;s weight, and the buoyancy force is determined by the weight of the water displaced by the object when it is placed in water (Archimedes&apos; Principle). If the gravitational force is less than the buoyancy force then the object floats, otherwise it sinks. That is, if an object weighs less than the amount of water it displaces then it floats otherwise it sinks. Principle of buoyancy A submarine resting on the surface has positive buoyancy, which means it is less dense than the water around it and will float. At this time, the ballast tanks are mainly full of air. To submerge, the submarine must have negative buoyancy. Seawater coming in through the flood ports forces air out the vents, and the submarine begins to sink. A submarine can control its buoyancy, thus allowing it to sink and surface at will. The hull of submarine has two walls and in between these walls are large containers called ballast tanks. Submarine can control its buoyancy by adjusting the amount of water and air in their ballast tanks. When the tanks are full of air, the submarine weighs less than the volume of water it displaces and it floats on the surface like a normal ship. When the ballast tanks are flooded with water, the submarine weighs more than the water it displaces, and it sinks. To surface again, the compressed air is released into the ballast tanks to force the water out, thereby reducing the submarine&apos;s weight. To move beneath the surface and to hover, the amount of water in a submarine&apos;s ballast tanks is made equal to the weight of the water it is displacing (neutral buoyancy). Gyroscope Submarines carry an inertial navigation system, which measures the boat’s motion and constantly updates position. 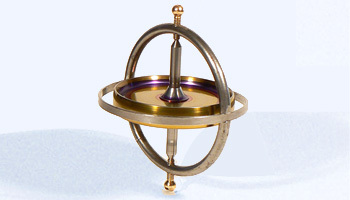 A gyroscope is a device for measuring or maintaining orientation, based on the principles of angular momentum. The submarines navigate using GPS(Global Positioning System) while it resides on the surface. The same will not work when it is under waters. Therefore the submarines use Gyroscopes to keep track of the motion from a fixed starting point. Although they are not easy to use but they can give accurate results at times. At times, these submarines use sonars to locate the target, by receiving the reflected sound waves that emit from the target. Just by knowing the speed of sound in water and the time it takes to get the reflection of the sound wave one could easily calculate the distance of the target. This is the same technique used by dolphins, bats and whales, etc. Distillation System A submarine is a sealed container that contains people and a limited supply of air. There are three things that must happen in order to keep air in a submarine breathable: Oxygen has to be replenished as it is consumed, CO2 must be removed and the moisture that we exhale in our breath must be removed. How air is supplied inside the submarine? 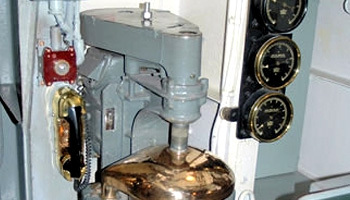 An oxygen generator which works on the process of Electrolysis is used to prepare oxygen in the submarines. The prepared oxygen is stored in pressurized tanks. 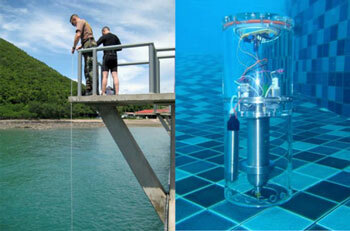 It can be made to release only when the gas sensor detects low level of oxygen in the submarine. The difficult aspect is to remove the carbon dioxide from the submarine. This is done using the soda lime in the scrubbers, where the CO2 gets trapped as it reacts with lime and hence it could be easily removed from the air. The Moisture could be removed using a dehumidifier, to prevent the condensation. How water is supplied inside the submarine? Using the process of distillation sea water can be converted in to fresh water. This water is mainly used as a coolant in the nuclear power plant which is powers the submarine. Almost 40,000 gallons of fresh water will be used as a coolant in one day. Efficient submarine The temperature of the ocean surrounding the submarine is typically 39 degrees Fahrenheit (4 degrees Celsius). The metal of the submarine conducts internal heat to the surrounding water. So, submarines must be electrically heated to maintain a comfortable temperature for the crew. The electrical power for the heaters comes from the nuclear reactor, diesel engine, or batteries (emergency). How do submarines maintain the required temperature? The members of the crew must stay warm for their survival inside the submarines. Extended exposure to the chill temperatures beneath the oceans will take away the heat present in the body. Proper insulation inside the vehicle and temperature monitoring is the most important in any marine vehicle. The temperature at the engine will be more compared to other regions inside the submarine. An efficient vehicle would identify the hot spots and drag all the heat to the colder parts of the vehicle ensuring a constant temperate through out the vehicle. Rescue system A Deep Submergence Rescue Vehicle (DSRV) is a type of Deep Submergence Vehicle used for rescue of downed submarines. How submarines are saved from accidents? If a submarine goes down due to its collision with another submarine (or) wall, then the crew will send a radio waves which will be used for locating the submarine. The Nuclear reactors would shut down depending on the impact of the collision. Hence the submarine runs with battery power. The level of oxygen consumption must be minimized, so that the crew would have some time to get rescued. Flooding of Submarine must be minimized. Should control the raise of CO2 inside the submarine. The crew must ensure that the battery levels doesn&apos;t fall out with in 48 hours after the collision. 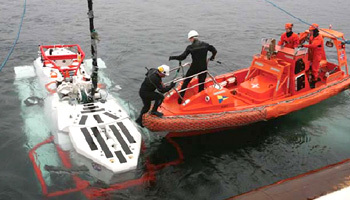 The Rescue vehicles include mini–submarines called Deep–Submergence Rescue Vehicles (DSRV). Communication between two Submarines Submarines use a specialized telephone system to communicate underwater. The telephone transmits and receives sound waves, whereas an AM radio (which broadcasts using amplitude modulation ) would transmit and receive radio waves. How to increase the efficiency of the Submarines? A submarine must be able to go to the surface of the sea and also to the sea bed as desired. It must go front, back and turn easily. 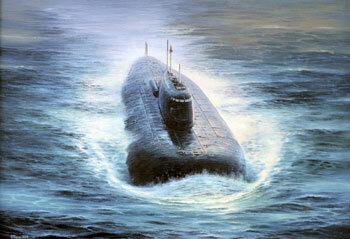 As the submarines have a large surface area it would experience a lot of friction and drag to slow down the ship. A smooth design and powerful motors give better efficiency. 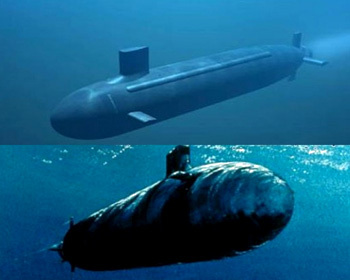 How do two submarines which are submerged in water communicate? The communication between two submarines may not be possible as the radio waves do not travel through a conducting medium (like. Salt water). Thus the solution is to raise the antenna of the submarine above the surface of the water level for any communication between the submarines.